Our CEO, Rob Goddard, will be speaking at the Dubai Business Breakfast (DBB) on the 14th February at the Sky Lounge, Gloria Hotel, Dubai Internet City. The group started in Oct 2011 and is one of the oldest free Knowledge Sharing/Collaborative Platform in Dubai. 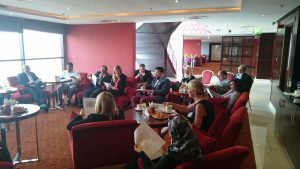 Meeting twice a month the group is for anyone interested in meeting businessmen and professionals in Dubai in order to exchange business information and to develop business relationships. The UAE has an active M&A market with both Trade and Venture Capital/Private Equity interest rising. The forthcoming World Trade Fair, changes to fiscal policy and increasing international interest in the region is encouraging SMEs, many of whom were founded during the oil boom, to considering selling their businesses. In an entertaining presentation, Rob will talk about the importance of the “Magic Number” – the capital sum a business owner needs to realise from the sale of the business. The Magic Number is at the core of exit planning, ensuring that all business goals are fully aligned to that objective.